Those of us who love Steven F. Havill's Posadas County Mysteries will relish the opportunity to read the surprising Easy Errors. Newcomers, fans of police procedurals, can pick up the series with this book. Easy Errors is a prequel to the prequel, One Perfect Shot. Welcome to Posadas County, a fictional small county in southwestern New Mexico. And, welcome to Undersheriff Bill Gastner's world. Gastner is the narrator of this account, the story of Robert Torrez' first week on the job. Fresh out of the academy, Torrez is on a ride-along the night before he officially starts his job. This is a night that will test the young deputy's mettle. Even in his living room, Gastner hears the crash at 9:17 PM. The undersheriff is the first at the scene. He finds the body of a teen, ejected from the truck. Before he can stop Torrez, the young deputy, the second to arrive, is checking out the victims inside the vehicle. Two of the three teenage victims are Torrez' younger brother and sister. Robert Torrez is a stoic throughout the entire investigation. Sheriff Eduardo Salcido has a small team, but he draws everyone into the case. Even so, it's Torrez and Gastner who do much of the fieldwork. At the same time, they still have other crimes to handle in Posadas County. It's a call to check out shots fired into a water tank and a windmill that will lead to the solution to the case. And, it's in a nearby canyon that Robert Torrez finds the body of another teen. Havill's latest mystery is a textbook example of a compelling police procedural. Readers can follow along, step-by-step as Torrez and Gastner investigate. At the same time, this is a heartbreaking story of a county where everyone knows each other, knows the victims. The grapevine is active with rumors, but the stories and residents of Posadas County bring the humanity to the mystery. Those of us who love Havill's mysteries will appreciate this look backward to a time when Robert Torrez was a rookie. There are glimpses of future characters, Reuben Fuentes, and his niece's adopted daughter, Estelle. Bill Gastner is still Gastner, though, which is a comfort. 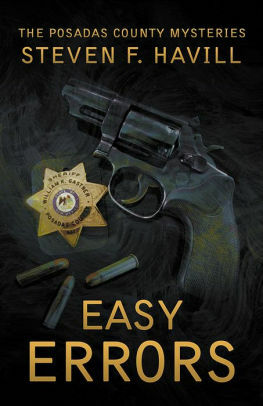 Whether you've read all of Havill's mysteries, as I have, or are just starting out, Easy Errors is a solid, satisfying police procedural. Easy Errors by Steven F. Havill. Poisoned Pen Press, 2017. ISBN 9781464209222 (hardcover), 262p. Can't wait! Like you, I've read them all. It will be interesting to see Bobby Torrez starting out, especially knowing where he is today. It was fascinating to see Torrez' beginnings, Jeff. I ordered a copy for my Mom a few weeks ago. I’ll get to read it after she finishes it. I really liked seeing the prequel to the prequel - back to the beginning, Sandy. OK, my library hasn't ordered it yet, so I bought the Kindle edition.